Northern Red Oak Leaves. Hollinger J. (2007). Northern Red Oak Acorns. Hurst, S. (2013). Northern Red Oak Trunk. Stadlin, E. (2013). Northern Red Oak Leaves. Stadlin, E. (2013). Getting down and dirty with the details of the Northern Red Oak can help to identify it. The first step in tree identification is distinguishing the characteristics that separate one tree species from another. By examining the different tree parts, you will be able to confidently identify any Northern Red Oak around campus. As an overview, the Northern Red Oak is a dramatic and powerful tree that grows to an average height of 82 feet and has a trunk diameter of 2 to 3 feet. In optimal conditions, the Northern Red Oak has been seen to grow up to 150 feet with a trunk diameter in excess of 5 feet. It forms a large ovoid crown with lofty branches. 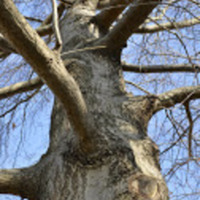 A deep taproot and spreading lateral roots are able to support the great height of this tree. The bark is the easiest way to identify the Northern Red Oak. It appears reddish-brown when young and darkens with age. With its deep furrows, the bark appears to have vertical silver-colored stripes. The unique character of the Northern Red Oak’s bark allows it to be identified during the winter, when the leaves are not available. The strong, sturdy branches of the Northern Red Oak, which exhibit an alternate branching pattern, extend from the trunk. Newer branchlets possess a dark red color. The buds of the Northern Red Oak are also distinctive. Their terminal buds (located at the tips of twigs) occur in clusters, are conical in shape, and are reddish-brown in color. 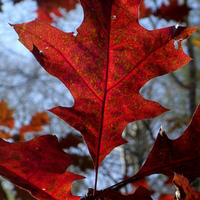 During certain times of the year, the leaves of the Northern Red Oak can be used for identification. Its leaves are oblong and are 5 to 8 inches in length. A distinguishing feature of the tree is sharped leaf tips. Further, the leaves possess 5 to 7 lobes that extend more than halfway to the midrib, which is the center vein extending through the leaf. The leaves of the Northern Red Oak are hairless underneath, except for axillary tufts of hair. 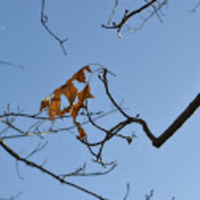 In the fall, the leaves of the Northern Red Oak fade from a dark green into their characteristic reddish-brown color. During autumn, the Northern Red Oak bears acorns as its fruit. These acorns are large and oblong to round with a very shallow disk-like cap. They can occur individually or in groups of 2 or 3 on short stalks. 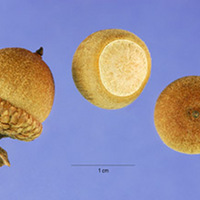 The body of the acorn is brown to reddish brown and has a smooth texture. The meat inside is white and bitter.